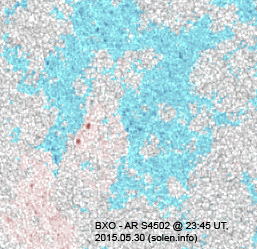 Last major update issued on June 1, 2015 at 05:00 UT. The geomagnetic field was quiet on May 31. Solar wind speed at SOHO ranged between 335 and 387 km/s. Solar flux at 20h UTC on 2.8 GHz was 94.3 (decreasing 29.1 over the last solar rotation). The 90 day 10.7 flux at 1 AU was 125.6. 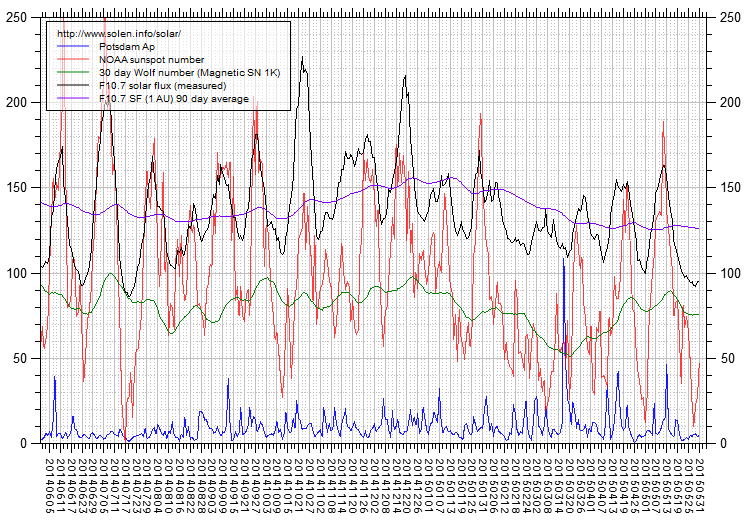 The Potsdam WDC planetary A index was 5 (STAR Ap - based on the mean of three hour interval ap indices: 4.6). 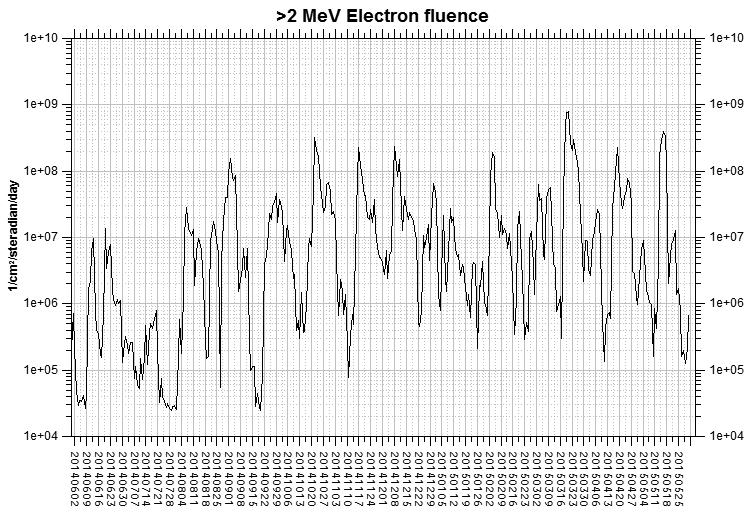 Three hour interval K indices: 11111212 (planetary), 21111312 (Boulder). The background x-ray flux is at the class B2 level. 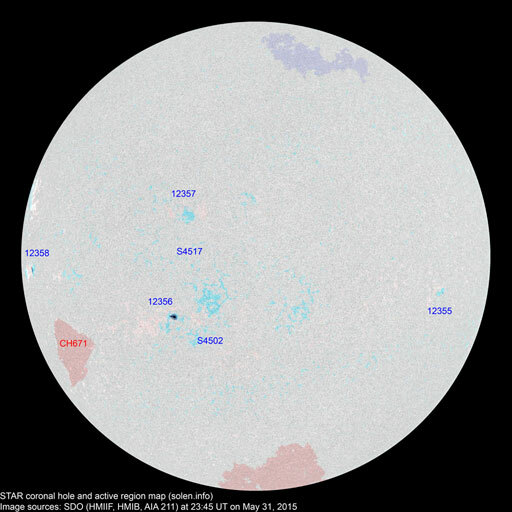 At the time of counting spots (see image time), spots were observed in 6 active regions using 2K resolution (SN: 98) and 6 active regions using 1K resolution (SN: 76) SDO images on the visible solar disk. Region 12355 [S09W54] developed early in the day, then decayed slowly. Region 12356 [S17E21] was quiet and stable. Region 12357 [N08E17] decayed slowly and quietly. New region 12358 [S04E73] rotated into view. S4502 [S14E12] was quiet and stable. New region S4517 [S03E16] emerged with a penumbra spot. 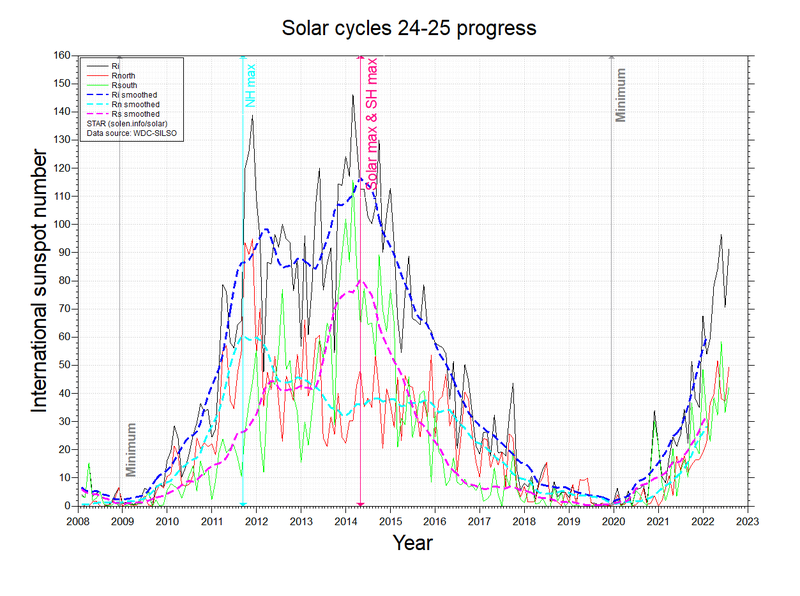 May 29-31: No obviously Earth directed CMEs were observed. 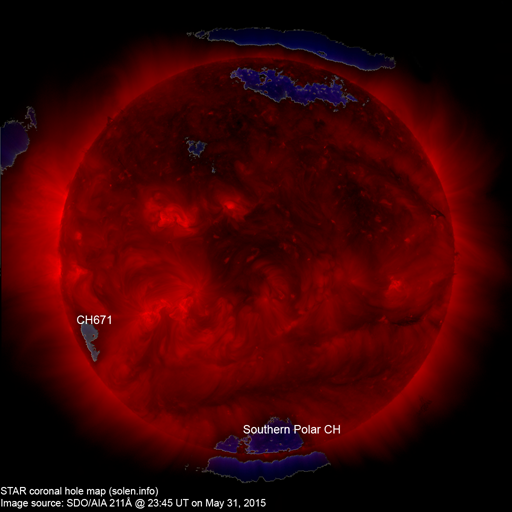 A recurrent southern hemisphere coronal hole (CH671) will likely rotate into an Earth facing position on June 4. Long distance low and medium frequency (below 2 MHz) propagation along paths north of due west over upper middle latitudes is poor to fair. Propagation on long distance northeast-southwest paths is poor. The geomagnetic field is expected to be quiet on June 1-3. 1) Effects from a coronal hole could reach Earth within the next 5 days. When the high speed stream has arrived the color changes to green. 2) Effects from a CME are likely to be observed at Earth within 96 hours. 3) There is a possibility of either M or X class flares within the next 48 hours. Green: 0-30% probability, Yellow: 30-70% probability, Red: 70-100% probability. 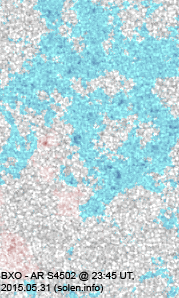 (Click on image for 2K resolution) Compare to the previous day's image. When available the active region map has a coronal hole polarity overlay where red (pink) is negative and blue is positive. Data for all numbered solar regions according to the Solar Region Summary provided by NOAA/SWPC. Comments are my own, as is the STAR spot count (spots observed at or inside a few hours before midnight) and data for regions not numbered by SWPC or where SWPC has observed no spots. SWPC active region numbers in the table below and in the active region map above are the historic SWPC/USAF numbers. 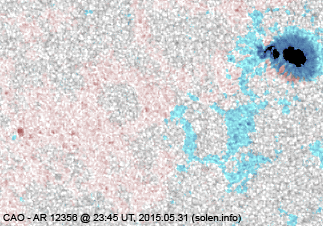 1) Running average based on the daily 20:00 UTC observed solar flux value at 2800 MHz. 2A) Current impact on the monthly sunspot number based on the Boulder (NOAA/SWPC) sunspot number (accumulated daily sunspots / month days). 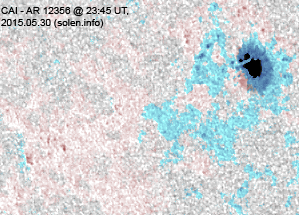 The official WDC-SILSO international sunspot number is typically 30-50% lower. 2B) Boulder SN current month average to date. 2C) STAR SDO 1K Wolf number 30 day average. 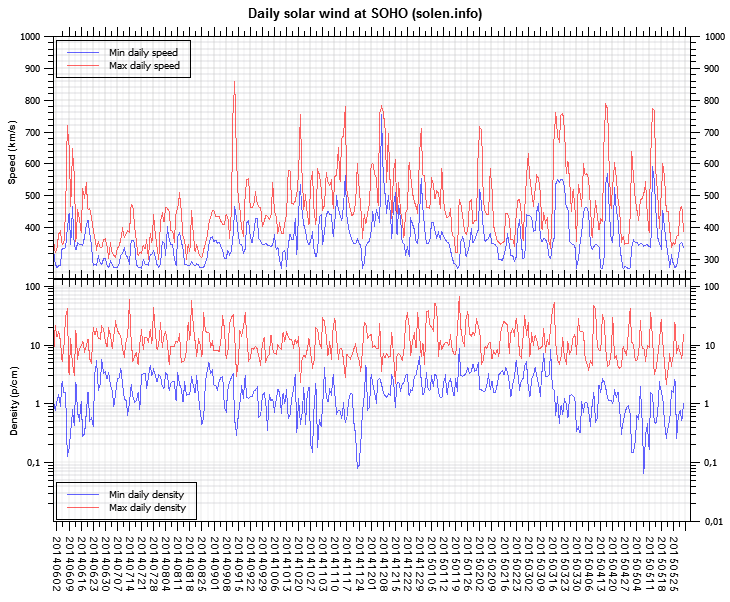 3) Running average based on the quicklook and definitive Potsdam WDC ap indices. Values in red are based on the definitive international GFZ Potsdam WDC ap indices. This report has been prepared by Jan Alvestad. It is based on the analysis of data from whatever sources are available at the time the report is prepared. All time references are to the UTC day. Comments and suggestions are always welcome. SDO images are courtesy of NASA/SDO and the AIA, EVE, and HMI science teams.